10 minute trains are great, but why is the promotion of them so incredibly vague and uninformative? If you improve a product, and want it to sell well, you need to make people aware of it. 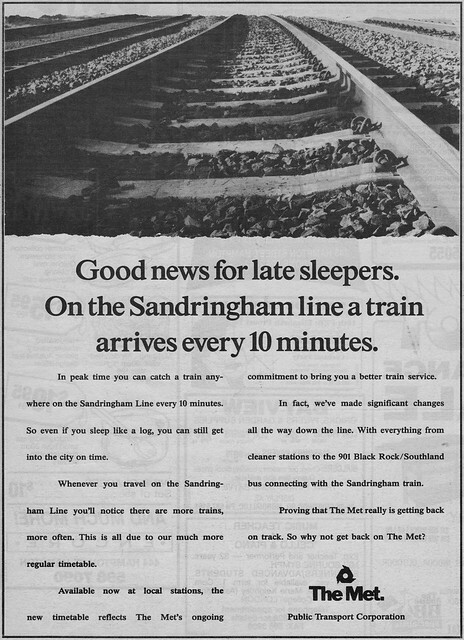 When they launched trains every 10 minutes between the City and Ringwood, Dandenong and Frankston last year on weekends, there was an initial bit of publicity via the media, but very little else. Witty? Perhaps. But what does it tell you? It could mean anything. And it implies the boost is on Sundays only. It might build brand awareness, and hint at the idea that people should consider PT for travel everyday, not just to and from work/school, but does nothing to tell you that, actually, weekend train services are better than they’ve ever been — and let’s face it, that’s what’s going to get people on board. While those who know have started using ten minute trains more (and loving it), and it’s relieved the crowding, a lot of people are completely unaware that Melbourne’s three busiest rail lines have such a frequent weekend service. The problem was brought home to me a couple of years ago (before the latest upgrade) when my stepfather said that he wished they’d improve Sunday (daytime) train timetables from running every 40 minutes. In reality on his line they haven’t run every 40 minutes since 1996. In that year they changed to every 30, then to every 20 in 1999. He had been thoroughly discouraged from using trains on Sundays many years ago, and hadn’t heard they’d improved. Many people are also unaware that you’ll pay a maximum of $3.50 per day on weekends and public holidays to travel anywhere around Melbourne. With Melbourne’s CBD booming on weekends, and inner-city traffic and parking often causing hassles, fast frequent trains have real potential to help people get around Melbourne. Not every line runs frequently, but if we’re going to see that happen, the ones that do need to be successful. Proper, clear promotion is vital to help make it so. 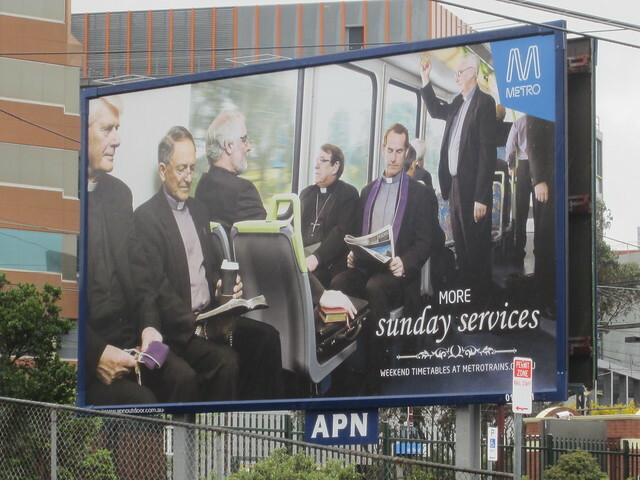 Pondering: Why aren’t MetroTrains promoting the hell out of their ten minute services? Actually, given the girl in the poster is wearing school unifrom, it is promoting PT to/ from school. If she was travelling from home to netball, she wouldn’t be wearing school attire. PS A cancelled train on Saturday meant I had to wait 40 minutes for the next Sandy train. This is not one of the favoured lines. You are so right about this: I live on the Ringwood line and I had no idea the trains were running on a ten minute timetable. @Marcus, good find! Most people are probably aware that MTR is Metro’s parent company (well, the main one). @Roger, a good example of how vague the advertising is, and how it can be interpreted quite different ways. 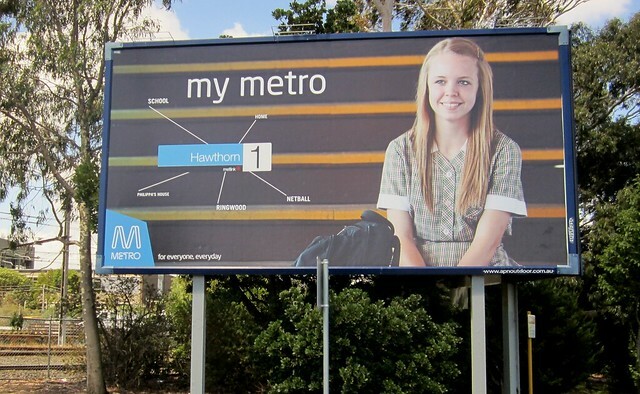 My reading of it is that while the girl portrayed is a student, the ad is encouraging use of Metro for other travel, “for everyone, everyday” (because there is no point in Metro promoting its services for student travel, which is mostly at peak periods when their resources are stretched). Other ads in that series feature different people pictured. @Katie, there you go — proof positive! Once Southland station is built, lots of advertising should be put up there to promote the 10 minute service it will receive 7 days a week. Why are four out of the five places general destinations that could be located anywhere and the fifth one is an actual suburb? It could be interpreted that all four destinations are in Ringwood. Haven’t worked out why vagueness is fashionable in marketing. It could either be due to an ignorance of the product’s selling points or a superstition amongst some marketers that subtlety equals sophistication and clarity means crassness. It may be believed that people are being bombarded with hundreds of messages each day and to reach their minds a less direct message may sometimes be thought more successful, especially if there’s a little punnery or wordplay. If marketers truly knew the product it should be possible to come up with something that’s both direct and connects with the customer. Eg something like ‘the new timetable you don’t really need’ sells not only the higher frequency but encourages a different way of using the network – ie ‘turn up and go’ rather than aiming for specific trains and times. Thats unconvincing. Old white men all drive cars. What does the first billboard tell me? Still find it ridiculous that some lines get a 10 minute frequency on weekends and I’m stuck waiting 20 minutes on weekdays.